Public computers and wireless networks are convenient and can be great resources when traveling or working remotely. However, it’s important to remember good online safety habits when using these devices. If you are using a public WiFi connection, a hacker on the same public network could potentially access your unencrypted personal data. Usernames, passwords, bank information, credit card numbers, browser cookies, and other identifying information can be viewed from your web browser and mobile apps. 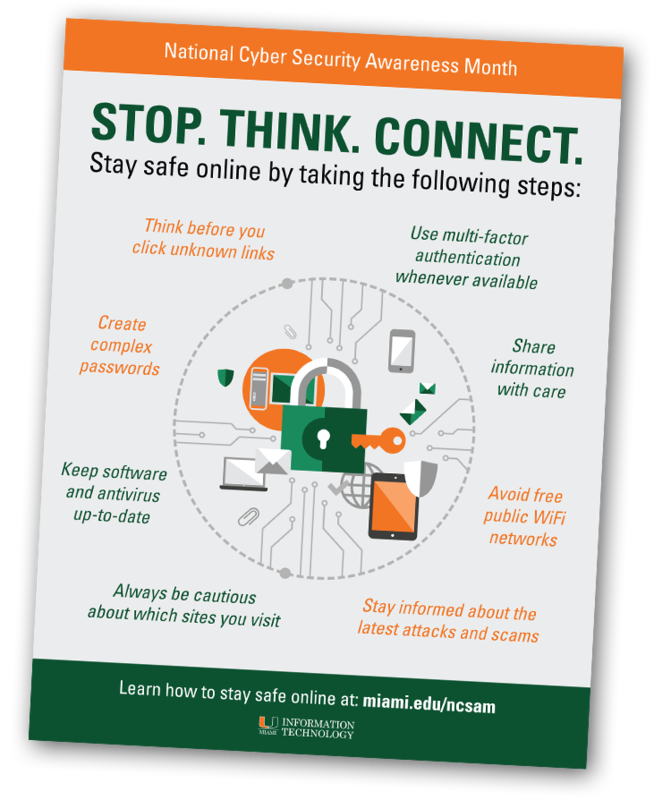 Using Pulse Secure VPN, the University of Miami’s virtual private network (VPN), can protect you from all of this while you are connected to public WiFi. Pulse is available to all UM faculty staff and students at no charge. A VPN is a secure connection between your computer/mobile device and any website or application. Whether you are browsing the Internet while having coffee at your local cafe or logging in to your bank account while traveling abroad, a VPN adds an extra layer of security on your computer by encrypting your data. Protect your privacy and security. Using a VPN encrypts your Internet connection to prevent hackers from viewing your online communications, location, and browsing activity. Ideal for travel. While traveling, you often connect to public or semi-public Wi-Fi networks in places like airports, cafes, hotels, or train stations. Anyone on the same unsecure network can potentially access your unencrypted data — that includes your usernames, passwords, bank information, credit card numbers, and more. Using the VPN is essentially a private network that only you can access, so you minimize the risk of theft or a data breach. To use the University’s VPN, please install the Pulse Secure client and then follow the instructions to connect. After you install the client, you can connect to the VPN at any time by visiting remote.miami.edu. For those that would like to use VPN from their mobile device(s), the Pulse Secure mobile application is available for free from the app store on your device.